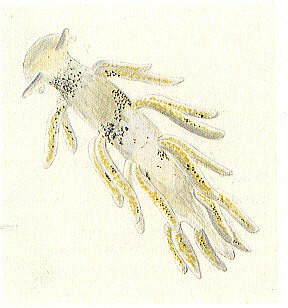 Description: A tiny nudibranch with few cerata, arranged in groups of two or three along each side of the body. The pale brown body is marked with tiny black spots as are the cerata. The digestive gland is pale orange in colour. The oral tentacles are small and directed laterally. Grows up to 8mm in length. Habitat: Normally found in brackish localities with salinity as low as 3 parts per thousand. The animals feed on hydroids, especially Cordylophora lacustris, Laomedea spp. and on Protohydra leuckarti. The spawn consists of a short, curved, lozenge-shaped mass. Distribution: There are few British records of Tenellia but it is probably widely distributed in estuarine conditions. Recent records are from the Bristol Channel and the Fleet in Dorset. In the middle of last century it was common at Rotherhithe on the Thames, in London's dockland. Similar Species: The small size and few cerata make it possible to confuse this species with juveniles of other Aeolids. Small lobes instead of normal oral tentacles. Cerata in rows of two or three. Small black spots on body and cerata surfaces. Picton, B.E. & Morrow, C.C. (2016). Tenellia adspersa (Nordmann, 1844). [In] Encyclopedia of Marine Life of Britain and Ireland.